Ascot was once little more than a scrubby heathland, but one day when Queen Anne was out on a ride with her favorite horse back in 1711, she saw something with far more potential. She felt that it would be the perfect place to allow a horse to sprint at full stride, as the area was pitch flat by nature. Full of enthusiasm of what could be, the first race at what would be the Royal Ascot took place later that year in August. With the inaugural event being named Her Majesty’s Plate and 100 guineas being made available to the winner, seven competitors stepped forward to push their six year old geldings to the limit in the name of glory and fame. Sadly, while records concerning the winner have been lost, this first running was a smashing success ensured that countless ensuing events would be held at this proving ground in the generations to come. While races were run at this site on a regular basis from that day forward, its growing popularity made the construction of a formal racecourse with abundant seating a priority. 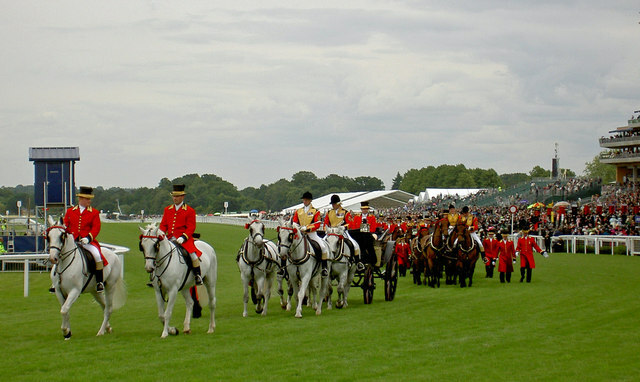 In 1794, the first stadium that would bear the name Royal Ascot was opened to horse racing enthusiasts, holding over 1,600 people at full capacity. While this first structure would require replacement after fifty years, the passage of an act of parliament in 1813 ensured its long term survival, as government funds would be committed to the perpetual upkeep of the Royal Ascot as a racing venue for the general public. While races have been run at the site of the Royal Ascot for over 300 years, it wasn’t until 1807 that the race series that takes its name from this course began to take the shape that we recognize it as today. It all started with the establishment of the Gold Cup in 1807, as this cup was positioned as the premiere prize of the four day event, a fact which remains to this day. While there have been many memorable races years over the multi-century history of the Royal Ascot, there have been many noteworthy events that have occurred over the past decade. Queen Elizabeth II re-opened the racing grounds after a two year renovation in 2006, and it was in that year that Yeats won the first of four consecutive Gold Cups, a feat that may go unmatched in the future of the Ascot, and it arguably stands above the Triple Crown as one of the greatest accomplishments in equestrian history. Looking to pick the next superstar that will emerge from the filed at the Royal Ascot this year? Check out Ascot results from previous years and pick this year’s winner on William Hill website.